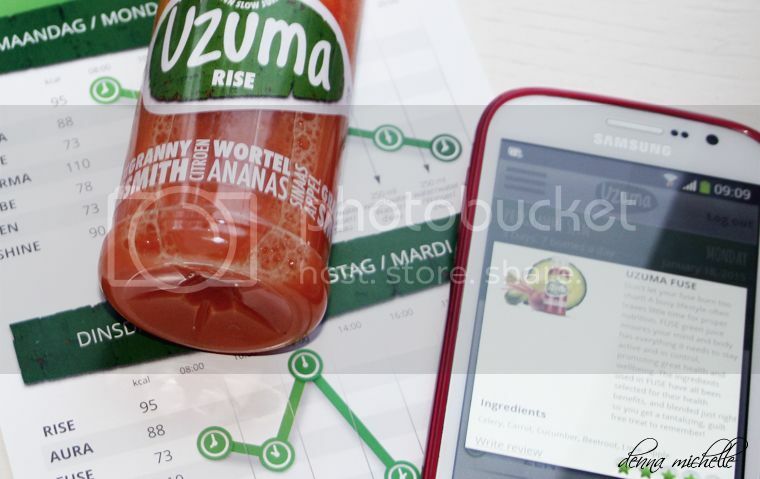 Uzuma send me their package with a track and trace, so I knew exactly when I was getting my big box full of juices. I was pleasantly surprised when I received my box, I got 21 juices in a big box with their logo/bottles printed on it. The box was fully lined with styrofoam and had an icepack inside. This was to preserve the juices freshness, and when I received my package the bottles where slightly frozen. So big props for that part, because you get the best quality juice delivered to your door. Uzuma offers 4 programs and you can check here Uzuma’s advice for what program suits you. To run down the programs, I listed the most important things about it bellow. The Uzuma SLIM programme has been specifically designed for those looking to lose large amounts of weight in a fast and safe manner. Uzuma supplies you with 7 bottles of highly nutritionally diverse green juices for each day of the programme, as well as our specially made Uzuma app to help you manage your regime. When combined with the desire to lose weight, Uzuma SLIM will have the kilos melting away. Uzuma STEADY programme is made for those looking to control and maintain their current weight. The combination of high nutrition, steady calorie intake and healthy meals will help you keep your weight goals on a level, avoiding the yoyo effect of so many other diets. 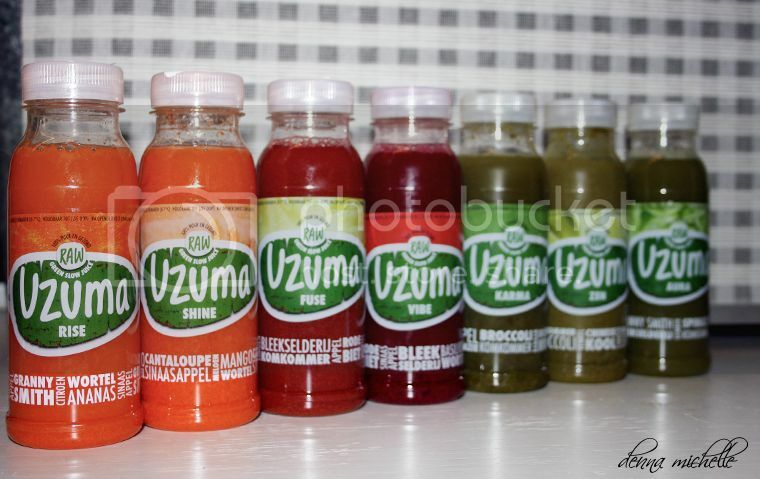 Uzuma supplies you with weekly packs of green juice to ensure you are getting everything you need! 4 bottles for each day. 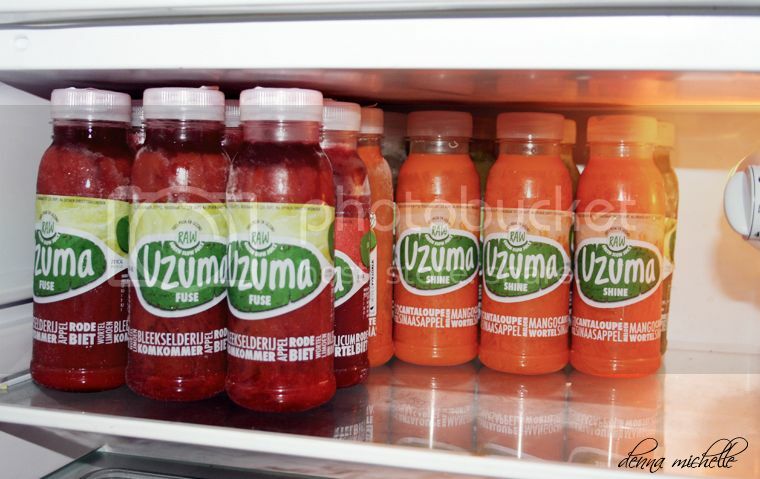 2 Bottles of Uzuma a day! Uzuma FIT is the ideal solution for those who are looking for an easy and convenient way to ensure they are getting all of the daily nutrition they require. Uzuma sends you weekly packs of Uzuma green juice containing everything you need to supplement a balanced lifestyle – allowing you to live your life without ever having to compromise. Programme DETOX is all about pushing the reset button. 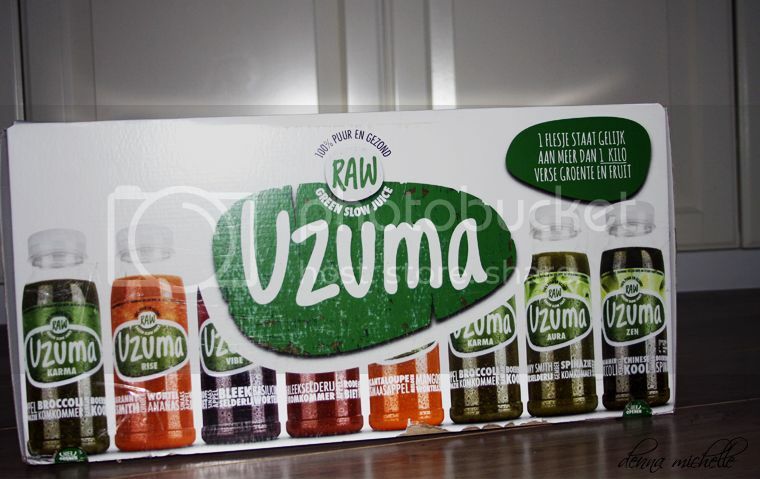 Uzuma nutritious, easy to digest green juices will give your body the rest and tools it needs to repair itself whilst bring your systems back into balance – eliminating anything holding you back. You will receive 7 bottles of our fresh healthy green juice for each day, keeping you on track as you prepare to enter into a healthier lifestyle. I had a hard time picking a program because they all sounded great, I am trying to loose weight for years now and even when I am eating healthy I can not loose weight. Even my doctor could not tell me why I am not losing weight. So I decided to pick Slim. I did hope that I would lose some weight while doing this, and I did! I lost 2.5 kilo’s in those three days, I felt full of energy and more fit. I am one of those people who forgets to do the thing she needs to do, so I was already making plans to hang a piece of paper and install some alarms for when I needed to take a juice. But when reading their site and blog I found this article. Telling me about their app, so I installed it and it works like a charm. Every time I needed a bottle, I would get a message also it reminds you to drink your water. I felt like it was a really good way to keep you on track and to make sure you drink every bottle you need. It is a great free app. 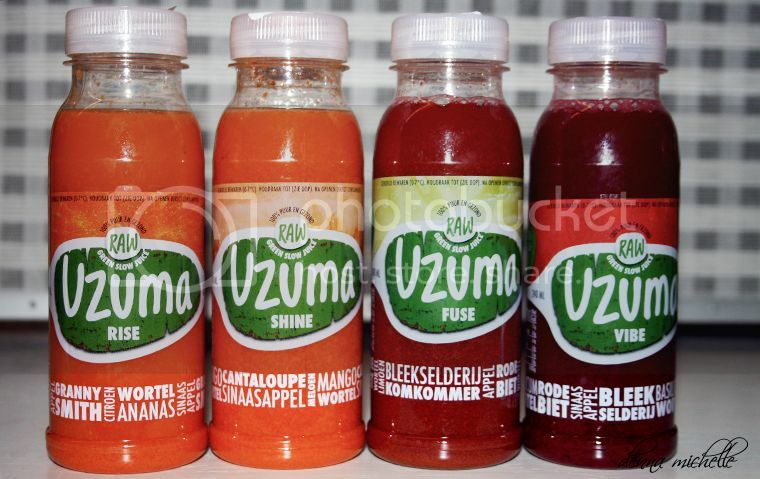 Uzuma offers 7 juices, all mixed to perfection. I really like that the bottles have a load of different ingredients, it is not just one thing but it is a blend of healthy ingredients. I also really like the taste of most of them, there is one that I do not like..but that is a personal preference. Rise is a very fresh tasting juice, I can clearly taste the carrots with a hint of lemon. This one I drank in the morning on day one and I felt awake in an instance and I felt like it was a little energy boost in a bottle. Opening the bottle I expected a strong scent but it was actually very mellow and pleasant. Shine is one of my favorites, a very fruity juice and perhaps the most fruity one of the the bunch with a hint of carrot. Fuse is a red juice that gets the color from beets. And it really tastes like beets but less nasty. I used to make smoothies with beets and those overpower everything. Yet this one actually tastes very nice, I think the combination with cucumber makes the difference. Karma was truthfully not that great, the combination is not my favorite and I think it is the broccoli, it felt kind of chunky and I had a hard time drinking it. Also I wanted a banana taste and I did not taste any banana in it. This is actually the only one that I do not like, but still it was drinkable. Zen is one of my favorites, and to be honest I tought I would not like it because of all the ingredients. I can not really pinpoint the flavor, one moment I taste broccoli and then cucumber…everything blends really good together. Aura is green based, and normally these are not so loved. But I have to say that this is one of my favorites. The taste that stands out the most is spinach and the granny smith apple. This is kind of a dinner in liquid form. I do have the habit to chew while drinking this, perhaps because it feels like I am really eating spinach. My mom, my friends and even my Grannie asked me during those three days, if I was hungry. It is a normal question considering I only drank juices. Also each bottle was only 240 ml, so I was also questioning if that would fill me up. But it did! I was so surprised when I drank my first bottle in the morning and felt full. I actually had the problem that I felt so full that I groaned when I heard an other alarm from the app, signaling me that I should drink an other bottle. I was still full from the bottle I had before that. If you are somebody who has a hard time to feel full and you overeat these juices are an option to add to your daily routine. The one thing that I have to point out is that I did miss chewing for those three days. I felt myself chewing during drinking and that was kind of silly. But you get used to it after day one. People warned me that I would feel tired and very low energy. That did not happen, I also did not experience headaches, nausea or something like that. I felt full of energy and healthy. After three days, would I do this again? Just living on juices? To be honest, I feel like the those three days I was just busy with drinking the juices and I felt rushed to finish them in time because I did not want to skip juices. I think the Slim version is perfect for people who need a three day ‘kickstart’ to healthy, who need the guidelines to follow to get into healthy habits. I personally would do the fit version if I had to pick again, that would mean only two juices a day and next to that healthy eating. 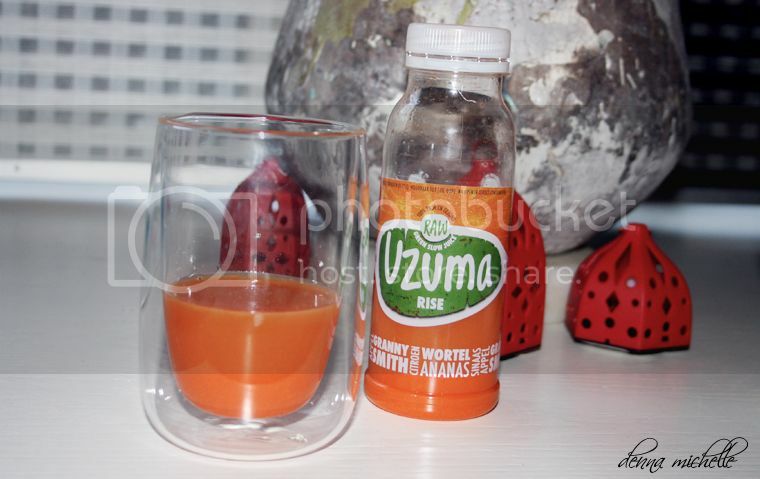 Uzuma is amazing because they use loads of different fruits and veggies, you are not just drinking one thing. You get everything you need from drinking 7 bottles a day and that is amazing. Also you can buy loose bottles for €3.50 a piece. You can check that out at this link. If you want to try this, with discount code Fresh2015 you can get a 25% discount. The code is valid till 31 January 2015. I am really happy that I tried this, it was really an experience. And I do feel like it did my body good, kind of detoxed while losing 2.5 kilo in three days. Also my belly fat went down and I lost 5 cm. If you want a fresh start with getting fit and eating healthy and you want something to start with. I would say, check Uzuma.